Just want to report that I've experienced no mangles here with new version. Tracks work as usual. Q: will there be a way to control activationbuttons A-Z via keycombo or shall I find out how to do it through AutoHotKey? There will be, eventually. No promises on a timeline for that, though. Update 2016-2-21 ** ScaleWalker & SnowglobeCore: minor refinements in scale-matching, and a bugfix for stuck-note protection system. *Up until now, cycles would play out all the way to the end once fired. This change is sort of on a trial basis, and I may revert it if anyone (including me) ends up feeling like they miss the original behavior. Bump is the most complicated of the options. You may choose boundary limits other than the param's max/min. You also (necessarily) choose what happens if the bump amount takes you to a boundary -- stop, wrap, bounce. If the repeat box is checked for the bump mode you then choose the number of times to repeat the bump over some number of beats. I wanted to ask for that, but I was sure that you do it. Great, very high automation level in Buzz, thanks for this highly appreciated update. :D I wanted to ask for that, but I was sure that you do it. I hope it comes in handy for you. By the way, the bounce option for a bump+repeat rule behaves sort of like peerlfo. Of course yes, my situation with peer machines became a sort of deadlock, and Scale Walker is definitely the way for me, but it also makes my stuff obsolete, I dreamed about a machine to centralize all commands, my first tests with peer rules are very positive, so thanks again for your crazy machines. Snowglobe, I can't PM you because of my 'newbie'-status ... Anyways, I got a crash using SnowGlobe TargetPractice. In 'index=n' mode while playing sounds, changing 'n' to an invalid index crashes SnowGlobe TargetPractice machine. 1. Start a new song in Jeskola Buzz. 2. Add SnowGlobe TargetPractice (I'll call it STP from now on). 3. Add a generator that accepts 'input' from the STP. 4. Add at least one note to the STP pattern, so it has sound playing. 5. Add/enable the pattern in the sequence editor and press 'play' (it should loop now). b. Set parameter '0-Mode' to 'index=n'. c. Changing parameter '0-n' to anything other than 0 crashes the STP on the next note. I love the potential of these peer machines of yours, I'll play some more with them and let you know if I find any more bugs. Once these machines come out of beta, they'll be awesome! Anyways, I got a crash using SnowGlobe TargetPractice. Anyway, you put ScaleWalker to a very high level, enormous tools, because ScaleWalker is a setup of machines, all the peer machines heritage is here, all these goodies combined in a very clever way, the interface is so clear, notes are modules, a single row can rule a lot of machines, great stability. The snap midi in is not saved in the bmx, honor midi filter and others are saved. Fantastic to play on my keystation88 with the synchro, I'm working to have a complete orchestra, scalewalker is amazing for contrapuntic improvisation. There is a small bug, if I load a bmx with a new set of scales, and if I edit one, when I reload it, scalewalker is crashed , we have can have 256 scales now, wasn't 128 before? We can make very funny things with "scale edit" 5 -3, give a fourth progression by tone, etc... very useful to design (quickly) short melodic elements. These machines seem incredible (though I wonder if a doofus like me will ever fully wrap his puny little head around them)! One problem: When I add the Scale Snapper machine and double-click it to open the GUI, I get this screen of crash log gobbledegook. If I click "OK" I get the machine's GUI, but clicking the "Scale" dropdown brings up the same error. Everything from SnowSuite.zip is in \Buzz\Gear\Generators\ and I'm running the latest version of Buzz (1503). Should be ok now. Also, 'Restore Factory Set' should work now, and new instances of machine get Factory Set instead of most recently edited set. 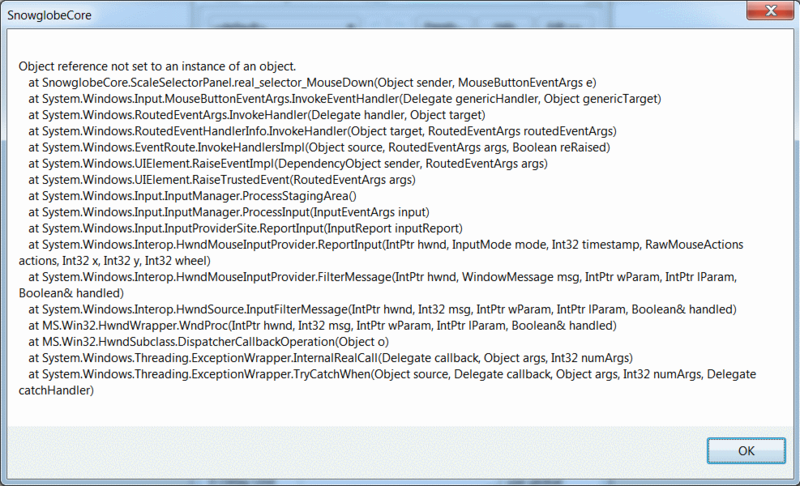 When I add the Scale Snapper machine and double-click it to open the GUI, I get this screen of crash log gobbledegook. This machine seems really exciting! Wish the tutorials were easier to find - maybe edit the links into the OP? 1. Is there a simple way of disabling / enabling all rules across all tabs? I'm trying to learn from the demo BMX, but disabling every rule one-by-one across 16 different tabs so I can follow along with the annotations in tab 1 is a bit cumbersome. 2. Is there any alternative to click-dragging? I'd really love textbox entry, especially when setting duration/cycle beats. 3. What's the quickest way of changing octaves? Is there anything similar to page up / page down in Polac's VST? Or do I have to manually assign everything one-by-one in the QWERTY editor screen? 5. What do the A-Z letters at the bottom of the GUI signify?